NCAA Basketball: When is a lead safe? The buzzer beaters this weekend were amazing. I was in heaven listening to Gus Johnson lose it as George Mason came back to beat Villanova, who were up by 6 points with less than 2 minutes to play. I asked myself, when is a lead safe in college basketball? It’s a topic that even Bill Simmons has bloviated on frequently in the past. To answer this question, I used a data set created by Brian Burke of Advanced NFL stats. (You can get the data here.) Brian took 1,782 NCAA games over 3 seasons and recorded the point differential each minute and which team ultimately won (a total of 360k in-game observations). The data includes the impact of home court advantage, so I normalized for that to take out the bias to apply to the NCAA tournament (all games on neutral courts). I found that it takes a lot more points than I thought for a lead to be safe. 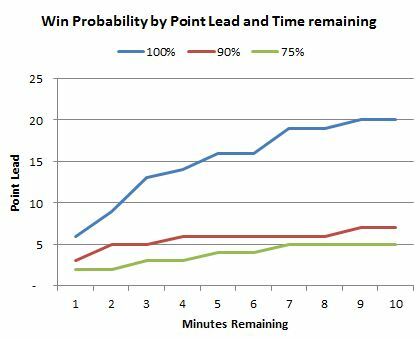 The chart below shows the number of points needed for a lead to be 100%, 90%, and 75% safe by time remaining. For example, a team with a 5 point lead with 9 minutes remaining has a 75% chance of winning the game, but would need a 20 point lead to have 100% chance of winning. What’s interesting about the graph is the distance between the 100% line and the 90% line. There never less than a 3-point gap between the lines and it gets as large as 13 points. A 100% certain win takes a huge lead. But the difference between the 75% line and 90% line isn’t much, often just a point or two difference. Even with a lot of time on the clock, adding a few point to the buffer can radically improve the chance of victory. And that George Mason – Villanova game? With 2 minutes left and a 6 point lead, the Wildcats had a 90% chance of winning, but needed 9 to have a 100% chance of winning. And the Patriots did what only 10% of teams are able to do and came back to win. Here’s a table that you can print out and keep with you for the sweet sixteen and beyond. 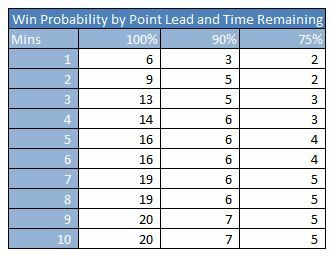 It gives you the number of points needed for a safe lead by minute remaining under different win probability scenarios. So now you can now that with 5 minutes remaining, the 6 point lead is looking pretty good. What halftime lead is safe? This season we’ve seen huge comebacks, including Duke erasing North Carolina’s 14 point halftime lead to win the game back on February 10th. How many points does it take for a 100% certain win with a full half remaining to play? 17 points. Good to know when watching Ohio State hit the locker room with a 26 point lead over George Mason on Sunday. The game was over. Will the rate of concussions increase if the NFL extends the season to 18 games?